Is Bio-Quinone Q10 Gold the 'Elixir of Youth' - we think so! Pharma Nord was the first company to introduce Bio-Quinones main component, co-enzyme Q10 (or CoQ10) - it's a naturally occurring substance in your body which plays a vital role in your body's energy supply mechanism and is a vital supplementation for those suffering with high cholesterol and high blood pressure. The increased dosage (100mg) of Bio-Quinone Gold promotes normal immune function, benefits patients with breast cancer, inhibits the development of periodontal disease and benefits those with Parkinson's disease. Taken daily, Bio-Quinone Q10 Gold can help maintain a healthy heart and skeletal muscles and helps to increase energy levels as well as promoting healthy skin. Ten million people here in the UK suffer with high blood pressure, or hypertension. That’s right, two out of every ten people in the UK need treatment for high blood pressure! Sadly what these people find is that conventional drug treatments can make it worse and can mean nasty side effects too. Co-enzyme Q10 is just as effective as many prescription 'high blood pressure' pills – bit it has no side-effects, and lots more benefits to it too! One of the most potent supplements for lowering high blood pressure is co-enzyme Q10 (CoQ10) – it is found naturally in your body. Tests have shown that it could lower your blood pressure - in a recent clinical trial (double-blind), a group of 76 patients with hypertension took 60mg of CoQ10 or a placebo for 12 weeks. At the end of the study, the patients taking CoQ10 had reduced their blood pressure by a more than healthy18 points. The researchers therefore concluded that CoQ10 is a safe alternative treatment for sufferers of hypertension and high blood pressure. Our CoQ10 is also known as Uniquinol because it allows your body to absorb up to 8 times more beneficial CoQ10 than other types of CoQ10. 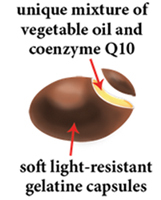 CoEnzyme Q10 (CoQ10) is vital to just about every function in your body. No other supplement supercharges your cells and helps to prevent and reverse heart problems; high blood pressure; blocked arteries; nerve damage; brain cell deterioration; abnormal cell growth; breathing problems; gum disease; skin damage; headaches; obesity; infertility muscle wasting; blood sugar imbalance – the list is endless – so, what we are trying to tell you is don’t ignore CoQ10! In total there are 1,000 research papers and 39 studies (controlled using placebos) conducted by more than 200 scientists and researchers from 18 countries all concluding that if your CoQ10 levels are low, you’ll age faster and you’re prone to accelerated disease and deterioration. "I've taken Bio-Quinone Q10 for years. It is vital for energy production and, as you get older, it becomes very important to top it up if you want to feel younger and keep active longer"
Those suffering with heart problems; high blood pressure; blocked arteries; nerve damage; brain cell deterioration; abnormal cell growth; breathing problems; gum disease; skin damage; headaches; obesity; infertility, muscle wasting, blood sugar imbalance. 1 capsule daily, unless otherwise advised. Do not exceed the recommended daily dosage. Do not chew the capsules, but swallow them whole, preferably during/after a meal.